"The trade has been dumbed down with any real training/apprenticeships gone." It reminded me of a couple of conversations I had with other EBBC attendees last week, when we wondered why mega-brewers would behave like this - basically, they are taking over all the technical beery stuff that goes on in a pub. After all, doesn't it cost them extra to do that? As far as I can see the answer is simple: it raises the hurdles facing any competitor looking to break into the business. You now have an on-trade - and to some extent also a customer base - that is fearful of change, of the unknown. Better the devil you know, and all that. It extends especially to cask ale - something else Ronan Brennan said to me was that "Bars want to take it on, but they worry about waste." He explained that they see you have to pull beer through each day, you can't sell the dregs and so on, and they contrast that with a keg where they know almost to the millilitre how much they can sell. But it also extends to new keg beers. If you as a microbrewer want to sell into a de-skilled bar, you have to provide the same level of support that the mega-brewers do. You have to provide taps. You probably have to provide cooling gear too, as what's there will belong to the mega-brewer. As for the pub, it's so much easier just to take another product line from your existing supplier. 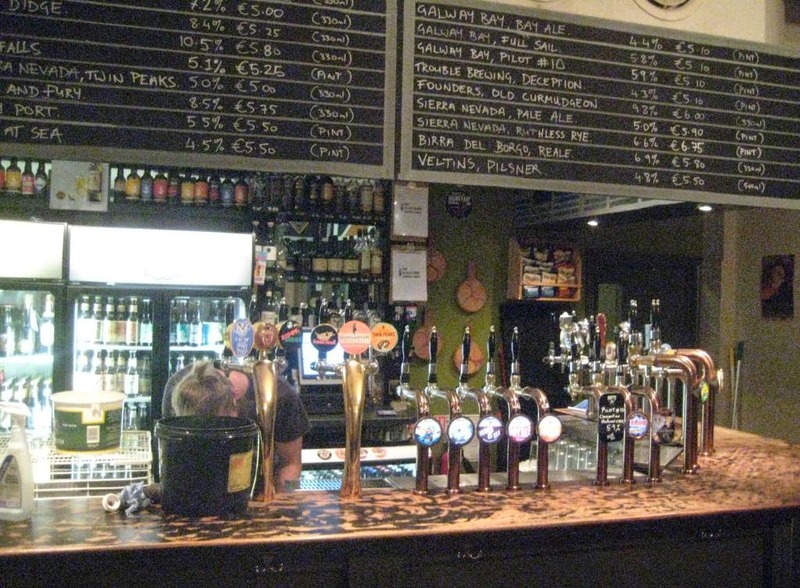 See that bar now offering Kilkenny, Smithwicks Pale Ale and Carlsberg alongside Guinness? They're all Diageo Ireland brands. The one offering Amstel and Sol alongside Beamish or Murphys? They're all Heineken brands. It's sad but true. In a market where others are stressing how skilled their staff are - think coffee shops and their baristas - it's in the big beer suppliers' interest to keep the publican dependent on them, being a shopkeeper rather than an artist. Thankfully, it doesn't always work. 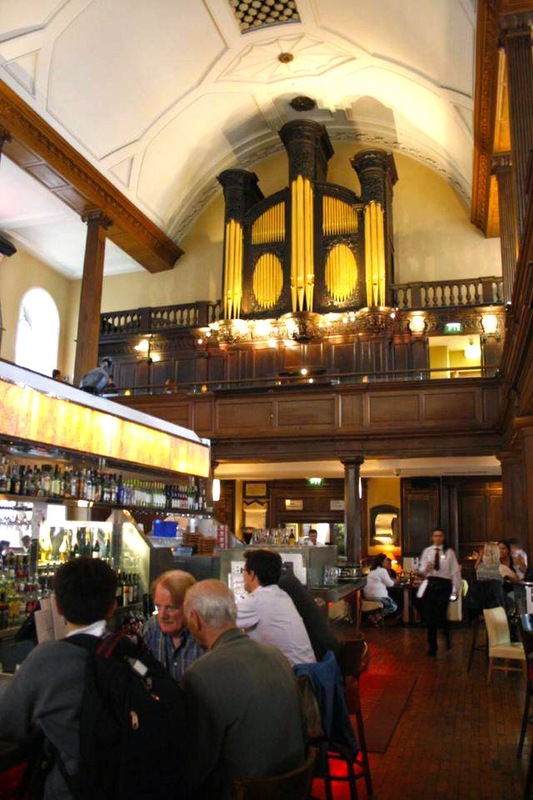 The photo above is of the Black Sheep pub in Dublin, and shows just what's possible with determined and knowledgeable management and staff (there's also three handpumps around the bar). And with Wetherspoons about to open its first pub south of the border, in the Dublin suburb of Blackrock - reportedly with a big real ale presence - you can't exactly see them handing their cellaring over to outsiders, can you? Still, it might explain why in most places you go, the choice will be keg black stuff or keg yellow fizz. Well, The Black Sheep is a bit of a different beast as it's what in Great Britain would be called a tied house: the owners have their own brewery so there's an extra incentive to drop the macros. But the likes of The Norseman and 57 The Headline, which could easily thrive on just the mainstream brands, do show what courageous management can achieve. Well, OK - the Black Sheep was also the best bar photo I had to hand. (-: I think all these pubs show though that the macros haven't completely de-skilled things. Thankfully.